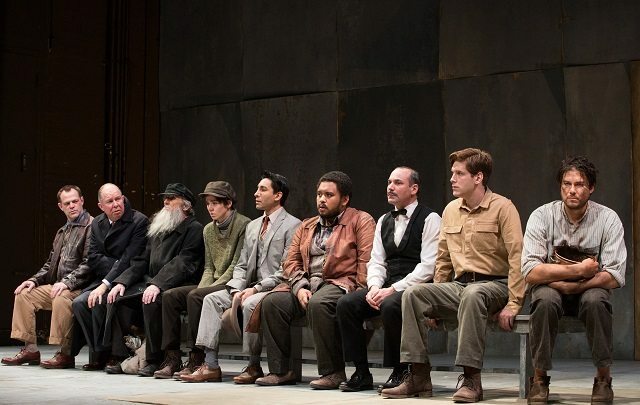 Actors, from left to right, Stuart Hughes, Diego Matamoros, Robert Nasmith, Courtney Ch’ng Lancaster, Kawa Ada, Peter Fernandes, Alex Poch-Goldin, Gordon Hecht, and Meegwun Fairbrother in Soulpepper Theatre’s Incident at Vichy. Photo by Cylla von Tiedemann. Do we really need to see yet another Holocaust drama? Yes, if the drama is less concerned with the historical details of that monumental tragedy and instead bent on figuring out why it happened. And especially yes, if it’s one that gets us thinking about carding, racial profiling, and Donald Trump’s presidential bid. That’s the case with Arthur Miller’s Incident at Vichy, receiving a rare and illuminating revival at Soulpepper right now. 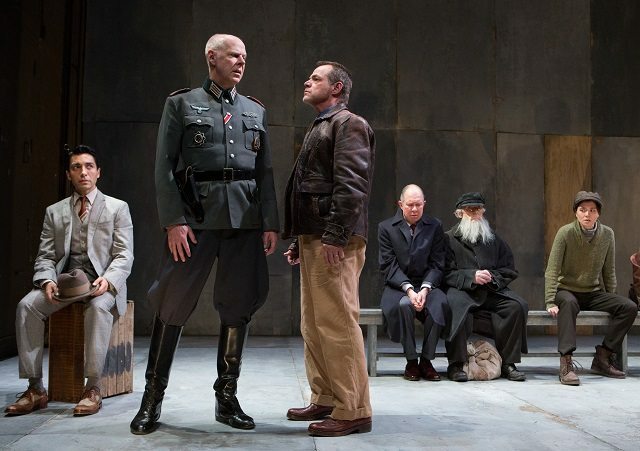 Yes, this is a minor Miller play, and for good reasons—it has its fair share of artistic flaws—but his efforts to see mass atrocities in terms of human nature and consider the factors that bring them about still make for gripping intellectual theatre. All-too-relevant theatre, too, as director Alan Dilworth’s modern-flavoured production reveals: once again, as in those masterworks Death of a Salesman and The Crucible, Miller speaks to aspects of humanity that haven’t changed. And during a U.S. election year when a bombastic dark horse has become the Republican presidential candidate by playing to racial hatred and national pride, there are uncomfortable parallels with the rise of a certain charismatic politician named Adolf Hitler. Miller wrote Incident at Vichy in 1964, after attending the trial in Germany of SS officers who ran the Auschwitz death camp; Miller, who was Jewish, wanted to understand how the German people could have perpetrated the Holocaust. The story itself was inspired by an anecdote the playwright heard from his former psychiatrist, a Holocaust survivor, involving a police lineup. The play is set in 1942 in Vichy, France—the infamous site of the French collaborationist government during the Nazi occupation. A group of disparate men have been detained by the police for reasons that aren’t clear. It may be some kind of routine wartime identity check, but then accompanying the cops is a sinister-looking German professor (Kevin Bundy) who says he’s from the “Race Institute.” One of the detainees, an artist (Peter Fernandes), claims the professor measured the length of his nose. Imagine being stopped by the cops just because your nose is long, or you have a long beard—not that hard to imagine today, really, especially if you’re a male whose skin happens to be darker than pink. Some of these men, however, refuse to believe they’ve been targeted as Jews. After all, their number includes a brusque businessman (William Webster), who is quickly released, as well as an affable Austrian prince (Diego Matamoros) who claims to be a gentile. But as the men sit nervously in a waiting room and trade observations and rumours about the current situation in Europe, their prospect grows bleak. There are reports of forced labour camps, of seeing a locked freight car packed with people, including women and children; someone has heard scarcely believable talk about furnaces. Miller structures the play as one anxious, 90-minute act, with the actors spending most of their time sitting on a bench, facing towards the audience. It’s a deliberate theatrical choice that other productions have tried to ameliorate (to use one of Miller’s favourite words)—including the staging by New York’s Signature Theater Company this past fall. But that hard bench and restricted movement, that sense of discomfort, is essential to the piece, linking it as much with the work of Beckett as with the kind of realism we often (and often mistakenly) associate with Miller. Indeed, perhaps the most powerful speech in the play has Leduc elaborate on this theme. He says the Jew represents to the Nazi the “other,” the stranger he can’t identify with—a defect which Leduc claims extends to all of us. Even “the Jews have their Jews,” he says. The play ends with a noble gesture by one of the other characters meant to defy Leduc’s assertion that we value self-preservation above all else, and yet Miller leaves us realizing such selfless acts are not only rare but, perhaps, futile. Oliver Dennis as the Major and Stuart Hughes as Leduc with, in the background, Kawa Ada, Diego Matamoros, Robert Nasmith, and Courtney Ch’ng Lancaster, in a scene from Incident at Vichy. Photo by Cylla von Tiedemann. The problem with the play, ironically, is that the Germans here remain “the other,” despite Miller’s attempt to humanize one of them—an unhappy major (Oliver Dennis) reluctantly recruited to oversee the proceedings. This is compounded in the production. Dennis and the others playing the German characters sport the kind of thick accents and Teutonic mannerisms that throw us back to countless Second World War movies. Indeed, Dennis’s cranky, limping major, at one point brandishing the inevitable Luger, is such a stock Nazi that he’s hard to take seriously, let alone sympathize with. But apart from the major’s drunken outburst late in the play, the German characters remain offstage much of the time, in their dreaded interrogation room. The drama’s focus is on their victims, and it eventually evolves into an exchange of views between two of the three last men on the bench: Hughes’s restless Leduc and Mantamoros’s gentle prince, Von Berg. Casting the rugged Hughes, who is no way fits any clichéd notions of a Jewish psychiatrist, is a brilliant stroke. It proves Leduc’s claim that a Jew can look like anybody, while turning the stereotypical man of action into a man with an active mind. The soft-boned Matamoros, on the other hand, is the very image of an effete aristocrat and his refined Von Berg begins by decrying the vulgarity of the Nazis—to the scorn of another character, who says it sounds like his biggest issue with them is their table manners. But later, the prince gives a poignant voice to Miller’s own bewilderment at how the highly civilized Germans could have embraced the thuggish Hitler and his Final Solution. When Von Berg describes witnessing Der Führer’s undeniable popularity among his household staff, he sounds as bemused as those of us trying to parse the mysterious appeal of Trump. Dilworth directed Soulpepper’s popular revival of Twelve Angry Men and there are plenty of superficial similarities between the two plays. For one thing, like Reginald Rose’s intense drama, Miller’s gives us a large cast of familiar character types. There’s Fernandes’s neurotic artist; a working-class communist (Gordon Hecht); a vain actor (Kawa Ada); an ingratiating waiter (Alex Poch-Goldin); a callow youth (Courtney Ch’ng Lancaster); a ragged “Gypsy” (Meegwun Fairbrother); and an Orthodox “Old Jew” (Robert Nasmith). Miller does subvert some of those stereotypes—while the Gypsy is continually accused of stealing, it’s Hecht’s electrician who ends up stealing from the Gypsy—but most of the men remain two-dimensional mouthpieces for different attitudes and viewpoints. The exceptions are Leduc, Von Berg, and the actor Monceau, played with flair by Ada, who has reluctantly given up his starring role in Cyrano de Bergerac in the interests of self-preservation. Lorenzo Savoini supplies a grim, grey set, Gillian Gallow some excellent period costumes, and Thomas Ryder Payne a spare sound design. The most alarming noise, however, is the cruel laughter of the cops and Nazis heard from the interrogation room after they’ve called in the Old Jew. It comes in noxious bursts, interrupting the onstage dialogue and sickening us with its implications. It’s the sound of civilized man reduced to a pack animal, gleefully tormenting the outsider, the “other.” It’s the music of fascism.